This is where separate the men from the boys, the true gamers from the casuals, and the righteous horror fans from the people who watch Let’s Plays of Slender: The Arrival on YouTube. It all begins with a simple question: “Have you played Resident Evil?” I’m not talking about Resident Evil 6: Michael Bay edition, I’m talking about the original, blocky graphics, fixed camera angles and shuffling zombies Resident Evil. If you have, good. If you played the 2002 GameCube remake, that will also suffice. The bouncer will let you into the rest of the article. He’s not even checking! What kind of bouncer is this? Okay fine, you can all come in, the horrible bouncer included. We’re here to talk about how Capcom is getting back to the series’ roots, literally, with Resident Evil HD Remaster. This isn't the first time Capcom has brought this classic survival horror games back from the grave. Like a Crimson Head, it won't stay down unless you double tap it, or burn it to ash. It's for the best though, because while the Resident Evil Gamecube remake was great, it's hard to play Gamecube these days unless you managed to keep yours around. With a fresh and updated HD remake, this version of the game is the best one we've seen to date. It still has some of the old issues like clipping and some of the pre-rendered backdrops look a little harsh and pixelted, but there's a reason this is referred to as a "classic." So, let's find out what's new and how it all comes together. I’m not going to sugar-coat it: Resident Evil 6 was not a Resident Evil game. Oh sure, it had the name on the cover, and it had some fun moments, but at no point was I scared. Well, I mean, I was terrified the entire time because I thought someone switched my disc with a Michael Bay rendition of “The Thing”, but at no point did the actual game scare me. It felt like Capcom turned a claustrophobic pioneer of survival horror into a big budget Hollywood blockbuster. In other words, WHAT WERE YOU THINKING? No one knew what to think, and I imagine Capcom was in the same boat. Well, when all else fails, you return to your roots. Go back to what worked, you know? The old system restore of the gaming industry. Of course, Lara Croft has gone back to the drawing board and been rebooted enough times to just toss the damn computer, but it all ended well with her latest outing. 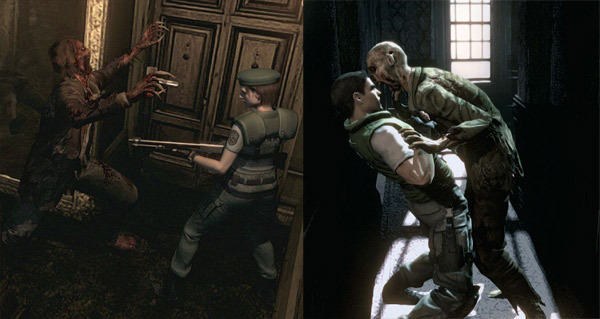 Capcom has decided to take the 2002 remake of the original Resident Evil from the GameCube, and remake it again! Honestly, I'm fine with that. Resident Evil HD Remaster takes the already overhauled remake from 2002 and adds a fresh coat of paint, along with some additional features fans will be happy to see. For starters, the game will run at 1080p and 30 frames per second on PS4, so that’s a good start. Secondly, the games 3D rendered environments have been upgraded in their resolution, and also feature modern post-processing effects like Bloom filters. This makes the already gorgeous pre-rendered environments pop even more so. The game can be played at the original 4:3 aspect ratio, or kicked up to 16:9 for a widescreen experience. Even the CG cut scenes have been updated to support the new aspect ratio. For the widescreen mode, the view will scroll as parts of the screen get cut off from the top and bottom. The ratio can be switched at any time as well. The audio has been remastered as well, with support added for 5.1ch surround sound. The controls offer the classic scheme, or an updated control scheme that goes in the exact direction of the analog stick. So let's just assume for a moment that you've spent the last several generations not playing video games and you've finally decided that gaming is the one true form of entertainment that transcends all other mediums of the form. First off, congratulations on taking on a hobby that only gets better with age. Secondly, you were probably told by just about anybody whose ever played video games that Resident Evil is (was?) the top dog. They are right if you're talking about everything up to RE4. You may look at this HD remake and wonder what all the hype is about. You may ask yourself "why does the character have to stand still to shoot?" or "Why do I only have a handful of inventory spaces?" Valid questions, mostly because we're trained to expect things like huge inventories and tons of crazy action from our modern "survival horror" games, and while that trend has been slowly fixing itself, things are still very different. You may look at all of these older design choices as flaws, but when you give it a chance, you see how it all fits together. I still find the ink ribbon save system to be annoying, if only for the reason that I can't play it for a short amount of time without feeling like I'm wasting one of my saves. Yes, you need to use an item that has a finite amount to save at specific points and if those run out you're S.O.L. A jigsaw puzzle's piece only fit one way, and this set of designs, tank controls and all, fits like a glove. Could it be improved? Maybe, but it's certainly not broken so as the old adage goes: "don't fix it." This game is what started survival horror and if you need to switch to the newer controls, you will still experience true terror. Whether it's turning a corner and coming face-to-face with a zombie dog, or running down a hallway as your footsteps echo across the yawning halls, the game never once lets up on the tension and atmosphere. The combat may feel awkward and flimsy, but doesn't that make it more terrifying as a result? It's not that it's broken, just designed in a way to maximize the tension and make every shot count. We've improved on a lot of things when it comes to horror games, but we've also taken a lot of steps backward. Resident Evil: HD Remaster is a reminder of what started it all, and shows us that despite some older design choices, the genre still has legs. Be ready for a slight learning curve and lots of backtracking, but otherwise you owe it to yourself to play this classic. Putting Aside the Nostalgia, What've we Got Here? You're absolutely right reader, this game should be judged on its own merits. I don't agree with all of the design choices, but I do find that the tense resource management and the strong atmosphere make the game a constant tension-filled experience. It's not like Outlast though, where the tension can become exhausting. It's more of a subtle background reminder that danger is always around the corner. The puzzles can be difficult, heck they can be downright insane, but when it all fits together you really feel like you've accomplished something in a way that a lot of modern games fail to do. The backtracking is tedious, I'll admit, but that moment when you "stumble" onto a room with an item box and a save point, the rush of relief is nigh palpable. The story unfolds slowly but steadily. You'll find tiny glimpses of texts, and your ability to examine the objects in your environment lends another layer of intrigue to the proceedings. The voice acting and writing is cheesy, there's no two ways about it, and yet the characters still manage to be endearing. They may be more wooden than Pinocchio at some points, but you never stop caring about what's going to happen to them. It's not the story that makes this a classic though, it's the fact that the whole package adds up to more than the sum of its part. Many of these designs on their own would make most games lose points, but like a secret recipe, it works when all the pieces come together and not a moment sooner. Resident Evil: HD Remaster still holds up after all of these years as a classic, maybe not the reinvention of the wheel we thought it was back in the day, but a classic nonetheless. It's not the perfect game by any means, but it is a reminder of what survival horrors games should strive to be. This plus innovation Capcom will bring the series back from the dead. Well, that and a remake of the second one. You are saying what every gamer is thinking. If they went back to there roots of survival horro and not zombie killers they could be good games again. What happened to being afraid to enter a room because all you have is 6 bullets and a knife? It went so main stream I began to hate the franchise! But... I will purchase resident evil hd.